A close correspondence between the house and the collections, between the rooms and the art they housed: this is the fundamental principle of the rigorous collecting and life style project that the brothers, Fausto and Giuseppe Bagatti Valsecchi, pursued in their house modelled on Lombardy’s lordly sixteenth century dwellings. A stairway with a beautiful wrought iron balustrade leads from the ticket area of the museum to the first – or ‘noble,’ as the Italians call it – floor of the mansion. From here, visitors enter the first room of Fausto’s suite. Even if some areas in the house were shared, the brothers each also had personal suites, creating two private areas in their home. A vestibule leads to the Room of the Fresco, which derives its name from a 1495 work by Antonio Boselli, a painter from the area around Bergamo. Depicting the Madonna of Mercy, the fresco comes from the parish church of Ponteranica (province of Bergamo). This first room of Fausto’s suite exemplifies the articulated and elegant evocation of the Italian Renaissance characterizing the Bagatti Valsecchi home. The room was used by the family as a private chapel for special occasions, such as weddings and baptisms. The Bevilacqua Room was the elegant private sitting room of Fausto Bagatti Valsecchi. Only in this room and in the Grand Salon are preserved the original precious wall coverings designed by the brothers for these rooms, and woven for them at the end of the nineteenth century. Among this room’s art works stands out the precious polymaterial panel, the Madonna and Christ Child, a work of the end of the fifteenth century by the Milanese painter, Ambrogio Bevilacqua. Fausto’s bedroom has some of the most important pieces in the Bagatti Valsecchi collection. Among these are the sixteenth century polyptych of the Virgin and Christ Child with Saints by Giampietrino, as well as the bed decorated with masterfully carved high wooden reliefs coming from the Visconti Venosta mansion in Grosio (Valtellina). The care and originality of the details contributes to the refinement of the room. A marble pavement simulates a fringed carpet, while in the ceiling’s coffers the intertwined letters of Fausto’s name alternate with Bagatti Valsecchi family crests. A small vestibule decorated with two sixteenth century stained glass windows (The Dormition of St. Martha; The Crucifixion) leads to Fausto’s bathroom. This seemingly sparsely decorated room is, in fact, the best expression of the Bagatti Valsecchi brothers' philosophy for their home: love for the past and the art of the Italian Renaissance wedded to the search for then-modern comforts. Despite their antique appearances, the bronze washbasin and the marble tub are really facilities with running water, quite avant-garde for the end of the nineteenth century. This room derives its name from the ceiling decoration, inspired by the sixteenth century Room of the Labyrinth in the ducal palace in Mantua. On the octagonal table, a collection of small antique tools and objects of daily use is arranged, including keys, locks and cutlery. The Bagatti Valsecchi brother’s attention dedicated to applied arts objects was born of their conviction that these objects were particularly adapted to their collecting characterized by domesticity, and that, furthermore, they could offer valid models of inspiration for then-modern nineteenth century artisans. The Cupola Gallery owes its name to the cupola with a skylight that hovers over it. Like the parallel Gallery of Arms, this space flanks the Grand Salon, and connects the two halves of the mansion, linking Fausto’s suite with that of his younger brother, Giuseppe. On the long tables against the room’s walls, some of the most important majolica pieces of the Bagatti Valsecchi collection are displayed, including a large vase with serpentine handles signed and dated 1678 by Ippolito Rombaldoni. This small room off of the Gallery of the Cupola was originally part of a stairwell. Today, it has been arranged as if it were a gentleman’s dressing room. 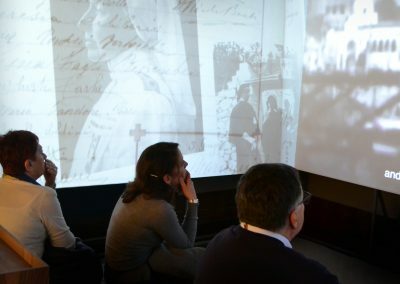 Visitors can nose around looking at photographs, or open drawers and little doors to peek at family heirlooms and simple objects of the family’s daily life in order to get to know Fausto and Giuseppe Bagatti Valsecchi and their descendants, who continued to live in the house until 1974. 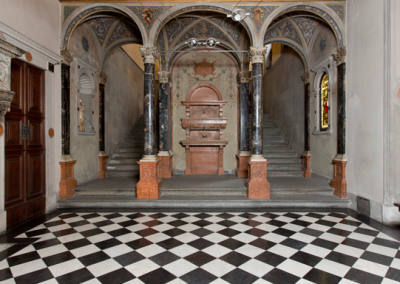 This room is the first visitors encounter in the suite of Giuseppe Bagatti Valsecchi and his wife, Carolina Borromeo. It was used as a sitting room, and owes its name to the wooden wall paneling once gracing a room with a heating stove in a centuries-old house in Sondrio. Above the room’s fireplace, an inscription in Latin paraphrasing St. Augustine warns those present against taking advantage of sitting in front of the fire to indulge in gossip: ‘he who speaks badly of those not present, may he know that this fireside is forbidden to him. The grand Sicilian bed of gilded wrought iron dominates the matrimonial bedroom of Carolina Borromeo and Giuseppe Bagatti Valsecchi. The sumptuous ambiance of the room offers the right background for the collection of beautiful fifteenth and sixteenth century panels displayed on the walls. Among these stands out the St. Justine painted by Giovanni Bellini and dated to around 1470. Of the other furniture, the antique pieces for children catch the eye, almost as if they were an allusion to the five children born to Giuseppe and Carolina. This room, adjacent to the matrimonial bedroom, was Giuseppe Bagatti Valsecchi’s bedroom. As other aristocratic gentlemen of his day, Giuseppe had his own private bedroom. On the tables, some liturgical objects are displayed, such as fifteenth and sixteenth century monstrances and reliquaries, underscoring the refined and precious atmosphere of this bedroom. In Fausto’s and Giuseppe’s day, this room was the first in which visitors entering on the via Santo Spirito side were welcomed on the first, or noble, floor. With its old paintings, carved furniture, elegant door frames and the two-tone marble floor, it hinted at the richness of the rooms of the Bagatti Valsecchi home. The room later was used as a study, in which the men of the house withdrew to read, to receive visitors, or to arrange to buy art and decorative arts for their house. A French door gives onto the open loggia that is not accessible on the museum tour. It looks over the internal courtyards of the mansion on one side and on via Santo Spirito on the other. The wall covering in this room is made up of four large panels derived from a pair of tapestries, woven in Brussels around 1570, depicting the life of the Persian king, Cyrus. On the left of the large fireplace, a door, today always closed, once lead to the room where the food arrived from the kitchens below thanks to a dumb waiter. On the central table and in the four display cabinets are Renaissance glass and majolica pieces. The Grand Salon, the house’s reception room par excellence, is the biggest room in the Bagatti Valsecchi home. The brothers created a room of double height, and embellished the wooden coffers of the ceiling with gilded carved pinecones. An articulated illumination system makes the room shine in all its sumptuousness: a grand central chandelier, eight wall lamps and, in each of the corners of the room, four floor lamps. Initially lit with gas, these lamps were converted to electricity, as soon as it became available. The Bagatti Valsecchi home, in fact, was one of the first private homes in Milan to have electricity, underscoring Fausto’s and Giuseppe’s interest in technological advancements and in the most avant-garde inventions of their day. Thanks to the project contributed by the Lissoni Associati studio, in June of 2015, the Bagatti Valsecchi Museum inaugurated a new space: the exhibit room. Originally a changing room for Carolina and Giuseppe, the space changed functions many times, and most recently served as a museum administration office. The new multi-functional room provides a well-adapted place for exhibits, meetings and events. The library, planned to offer an ambiance well-suited for study and concentration, is furnished with built-in wooden cabinets. The room’s pictorial decoration, realized in 1887 by Luigi Cavenaghi, was inspired by the 16th century frescoes by Bergognone in the chapter house room of Santa Maria della Passione in Milan. A precious pair of globes—one terrestrial, one celestial—datable to 1579 is perched on 19th century pedestals, while the long central table sports antique objects in ivory, little coffers and scientific instruments. A staircase, solemn in style, leads from this room on the ground floor on the via Santo Spirito side to the first floor study. In the museum visit plan, the Atrium no longer functions as an entrance, but originally it and the monumental staircase allowed the two gents to access their suites, independently. Among the elegant fixed furnishings, the red marble basin of a Renaissance fragment set in 19th century elements catches the eye. In this long room, parallel to the Cupola Gallery on the other side of the Grand Salon, the two brothers displayed their collection of arms and armor, one of the distinctive traits of Lombard collecting. As is the rest of the house, antique examples are flanked by pieces “in style”, or by antique works whose missing pieces were substituted in the 19th century, in order to create the impression of an antique armory. Apart from the shields and armor, the collection is made up almost entirely of arms with blades because, more than firearms, they seemed to the brothers to better evoke the idea of the Renaissance they were seeking.